Grace Gallatin Seton. A Group at the Entrepôt des Dons of the Bien, 1918-1919. From Report December 1917–December 1919. Greenwich Historical Society, William E. Finch, Jr. Archives. Gift of Karin Crooks. Report December 1917-December 1919. Greenwich Historical Society, William E. Finch, Jr. Archives. Gift of Karin Crooks. 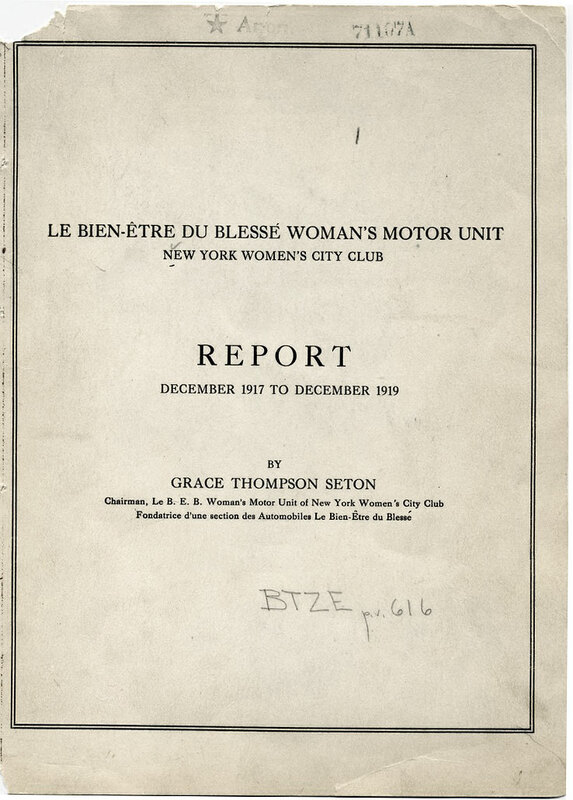 Grace Gallatin Seton, wife of the famous nature writer Ernest Thompson Seton, founded Le Bien-Être du Blessé (Welfare of the Injured) Women's Motor Unit in 1916. She was awarded medals from England and France for establishing this all-female transport service which moved people and goods in the war zone. 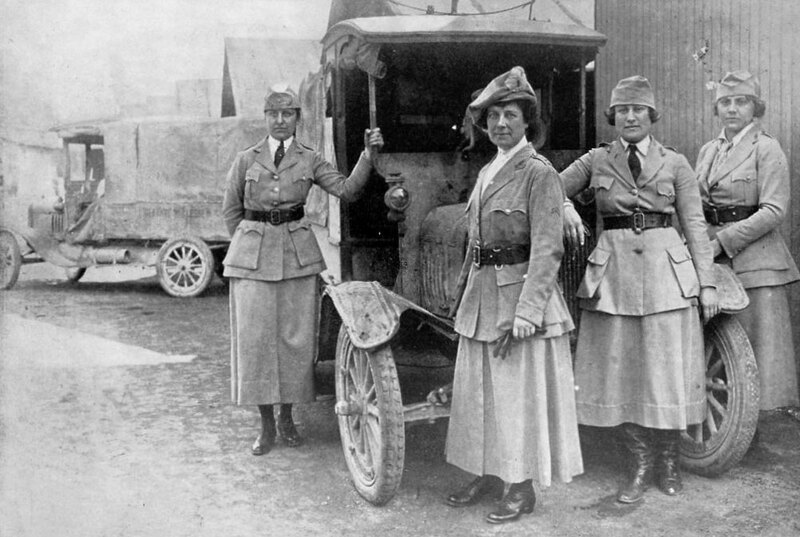 Seton was one of a number of nationally recognized suffragette leaders from Greenwich—including educator Caroline Ruutz-Rees and art collector Louisine Havemeyer—who realized that women's serious participation in the War effort was not only patriotic but could also advance the "votes for women" campaign. 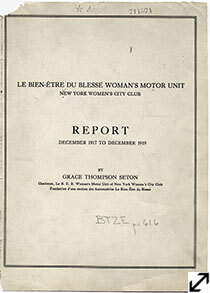 It was no coincidence that Seton's motor unit was sponsored by the New York Women's City Club, an organization founded by suffrage supporters in 1915. Women's passionate service during the War inspired the previously reluctant President Woodrow Wilson to finally agree to women's suffrage. As he recognized in a speech to Congress in 1918, "We have made partners of the women in this war; shall we admit them only to a partnership of suffering and sacrifice and toil and not to a partnership of privilege and right?" Women finally won the right to vote with the Nineteenth Amendment to the Constitution in 1920.